Summary. The exact eigenmodes of shallow shells with simply supported opposite edges is obtained. Eigenmodes of linear vibrations of shallow shell with two simply supported and two free edges are treated. 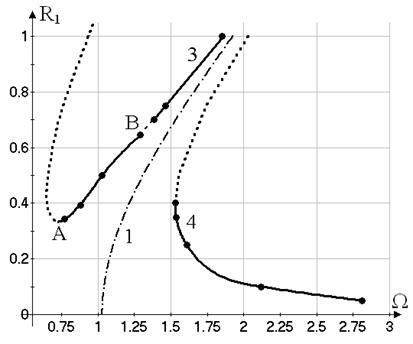 The vibrations of shallow shells with geometrical nonlinearity in the case of an internal resonance are described by two-degrees-of-freedom system with essential nonlinearity. The interaction of two shell modes is described by this system. The harmonic balance method is used to study this system. The stability of shell periodic motions is analyzed. The shallow shell bifurcation behaviour is analyzed; symmetry-breaking and saddle- node bifurcations are observed. Shallow shells are elements of turbines, aircrafts and marine structures. Significant dynamical loads frequently acts on these structures, which can lead to their failure. Shallow shells perform lateral vibrations with amplitudes, which are commensurable with the shell thickness. Then the shells motions are described using geometrically nonlinear theory. Many efforts were made to study vibrations of shallow shells with geometrical nonlinearity. Grigolyuk  investigated the vibrations with moderate amplitudes of simply supported panel using two-mode expansion. Cummings  considered the vibrations of simply supported cylindrical panel under the action of impacts loads. Using single-mode approximation, Leissa and Kadi  investigated nonlinear free vibrations of simply supported shallow panel with different values of the principal curvatures in two orthogonal directions. 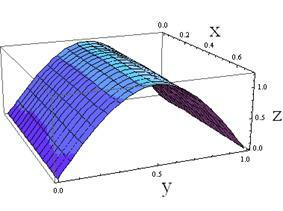 The nonlinear vibrations of simply supported cylindrical panel are analyzed by Vol’mir, Logvinskaya, Rogalevich . Three and five degrees-of-freedom models are treated. Free vibrations of clamped cylindrical panels are analyzed in the paper . The spline finite strip method is developed to analyze free vibrations of doubly curved shallow shells with rectangular base in [6, 7]. Liew and Lim  analyzed linear free vibrations of rectangular base shallow shells with different curvatures and different boundary conditions. The middle thickness shallow shells are analyzed accounting shear by Liew, Lim . Baumgarten and Kreuzer  analyzed two- and four-modes models of cylindrical panel nonlinear vibrations. Yamaguchi and Nagai  investigated chaotic vibrations of square base shallow shells with flexible edges using finite degrees-of-freedom shell model. Awrejcewicz and Krysko  analyze the period-doubling bifurcations and chaotic motions of rectangular plate. The forced vibrations with moderate amplitudes of doubly curved panels with rectangular base in the case of the internal resonance are considered in . Nonlinear vibrations of shallow shells with complex boundaries are treated in [14, 15]. The influence of the initial imperfections on the nonlinear vibrations of shallow shells is analyzed by Amabili [16-18]. The exact eigenmodes of the rectangular plate with two simply supported opposite edges are obtained in . The similar expressions for open cylindrical shells are derived in . Free vibrations of Levy- type thick functionally graded cylindrical shell panels are investigated to identify the validity range of Donnell and Sanders theories in . Free vibrations of two-dimensional functionally graded open cylindrical shell are analyzed using 2-D generalized differential quadrature method in . Nonlinear modes of simply supported cylindrical shell are treated in . Free and forced vibrations of shallow cylindrical panel, which is simply supported at the opposite edges and free at others edges, are analyzed. The exact eigenmodes of shallow shells with simply supported opposite edges are obtained. The effect of the shell parameters on the eigenfrequencies and eigenmodes is analyzed. It is shown that the first eigenfrequency does not depend on both the shell curvature and the length along simply supported edges. If the length along the simply supported edges is increased, the higher eigenfrequencies are decreased. The shell nonlinear vibrations with moderate amplitudes in the case of internal resonance are considered. Due to this internal resonance two eigenmodes of shell vibrations are interacted. In order to study this interaction essentially nonlinear two-degree-of-freedom system is obtained and analyzed by using the harmonic balance method. As a result of stability analysis, saddle-node and a symmetry-breaking bifurcation are analyzed. where are displacements of the shell middle surface in directions, respectively; , are Young’s modulus, Poisson’s ratio and material density; and are curvatures of shell middle surface in x and y directions, respectively; is the shell thickness; are intensities of the external forces. Nonlinear vibrations are expanded into the truncated series by eigenmodes. Therefore, before analysis of nonlinear problem, the shell eigenmodes are calculated. Then the nonlinear terms are not taken into account in the equations (1-3) and it is assumed that . In future analysis it is considered the doubly curved shallow shells with arbitrary boundary conditions at the edges ; . The boundary conditions (4) satisfy at the edges and . One element of the eigenvector is taken equal to 1: . We stress, that the values and are complex. If the solutions (11) are substituted into the equations (14), the homogeneous system of eight linear algebraic equations with respect to is obtained. For the first eigenfrequency the eigenmodes of the lateral displacements takes the form (A.1) from Appendix. The eigenmodes and takes the form (A.2) from Appendix. The solutions (A.1) and (A.2) are substituted into the boundary conditions (14). As a result the system of linear algebraic equations with respect to is obtained. The frequency equation with respect to is obtained by equating to zero the determinant of this system. The parameters are obtained from the system of linear algebraic equations. Using the above-considered approach, the exact analytical form of eigenmodes is derived. These eigenmodes are presented in Appendix. The suggested approach differs from the method , where the last boundary condition (4) is not taken into account. We stress that the eigenmodes (6, 10, 11) satisfy all boundary conditions at the edges and . The steel shallow shell with the following parameters: N/m2, kg/m3, , a1=1 m, a2=0.6 m, h=0,01 m, m is analyzed. The edges and satisfy the boundary conditions (5). Table 1 shows the results of eigenfrequencies calculations. The eigenfrequencies of the plates, which are obtained using the relations from [20, 26], are presented in the first row. Table 2 shows the dependence of the eigenfrequencies on the shell length at a1=1 m, m, h=0.01 m. For all considered parameters of the shell the eigenmode of the first eigenfrequency ( ) have no nodal lines parallel to axis. The eigenmodes of the second and the third eigenfrequencies have one and two nodal lines parallel to у axis, respectively. As follows from Tables 1, 2, the frequencies of the eigenmodes without nodal lines parallel to у axis do not depend on the shell geometrical parameters; the frequencies of the eigenmodes with one nodal line parallel to у axis do not depend on shell middle surface curvature. The eigenfrequencies of the shallow shell are determined by the Rayleigh-Ritz method to verify the obtained results. 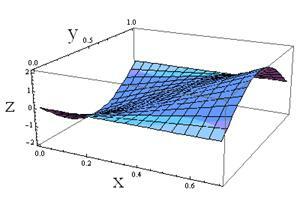 The trial functions are used for the expansions of , which satisfying the boundary conditions (4). Table 3 shows the results of the eigenfrequency calculations for the shells with the parameters a1=1 m, a2=0.7 m, m, h=0,01 m. As can be seen from Tables 2 and 3, the eigenfrequencies, which are obtained by the Rayleigh-Ritz method, are close to the eigenfrequencies, which are obtained from analytical analysis. As follows from Tables 1 and 2, internal resonances can occur in the shallow shells. Fig. 2 shows three eigenmodes of the shell linear vibrations with the following parameters: a1=1 m, a2=0.7 m, m, h=0.01 m. These eigenmodes correspond to the eigenfrequencies: 154.9; 324; 619.9 rad/s. where are generalized coordinates of the shell; are normalized vibrations eigenmodes, which are determined in the previous section. where the parameters are obtained from the numerical calculations. Solving the system of linear algebraic equations (20, 21), the generalized coordinates are obtained as functions of . These solutions are substituted into the system of ordinary differential equations (19) and the -degrees-of-freedom model of the shell vibrations is obtained. where is small parameter, is detuning parameter. The results of forced vibrations analysis are shown on a frequency response. The continuation technique  is used to obtain a frequency response. Then one of the parameters from is preset with certain step. The rest parameters are obtained by the solution of the system of nonlinear algebraic equations (24). The system of linear differential equations with periodic coefficients (25) is solved four times to calculate the fundamental matrix. This system is solved numerically by the Runge- Kutta method. The multipliers, which are eigenvalues of the fundamental matrix, are calculated. Stability of periodic solutions is estimated by using of the multipliers [28, 29]. a1=1 m, a2=0.7 m, , m, h=0.01 m, E=2.1∙1011 N/m2, ν=0.3. The nonlinear dynamics of the system (22) is studied. Note, that the quadratic and cubic terms contribute essentially into the system (22). The harmonic balance method is used to analyze the dynamics of the system (22). The harmonic balance method is applied to analyze the forced vibrations in Section 5. Then the solution (23) contains the frequency of the external force . In this section the harmonic balance method is used to analyze free nonlinear vibrations. In this case the solution (27) contains unknown frequency . 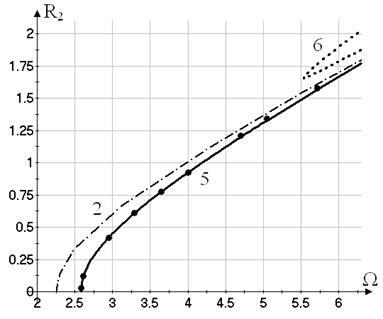 The calculations with sequential increase of the number of terms in the expansion (27) are carried out to determine the sufficient number of terms to approximate nonlinear vibrations. It is determined that four terms of the expansion (27) are enough to approximate the vibrations. Fig. 3 shows by dot-and-dash line the backbone curve for the vibrations amplitudes . where is unknown frequency, which is determined. The harmonic balance method considered in the previous section is used. As a result of these calculations, the motions, which are denoted by number 2 on Figures 4, 5, are obtained. These vibrations have two active generalized coordinates and . In this regime the harmonics with the amplitudes and dominate in the solutions and , respectively. Now the forced motions of the system (22) are analyzed. It is assumed, that the external force with amplitude N is applied at the point . Then the parameters of the system (22) are: ; . The parameters is equal to zero as the second eigenmode satisfy the equation . The harmonic balance method is applied to the system (22). where Т is vibration period. The vibrations, which are described by the curve 5 (Fig. 4, 5), are forked from the motions (30) due to the symmetry-breaking bifurcation . This bifurcation behavior is determined on the basis of the numerical calculations of the multipliers. Now the vibrations with two active coordinates are treated. These motions are described by the curves 5, 6 on Figures 4, 5. The harmonics with the amplitudes and predominate in the Fourier-series expansions of the generalized coordinates and , respectively. Note, that the harmonics with the amplitude contributes into the Fourier-series expansion of . The direct numerical integration of the system (22) is carried out to verify the results, which are obtained by the harmonic balance method. The initial conditions for the direct numerical integration are chosen from the results, which are obtained by the harmonic balance method. The results of the direct numerical integration are shown by dots in Figures 3-5. Thus, the results of the harmonic balance method and the data of the direct numerical integration are close. The exact analytical expressions for the vibrations eigenmodes of shallow shells with rectangular base and two simply supported edges are derived in this paper. The connections between the eigenfrequencies of the panels and the shell geometrical parameters are analyzed. It is shown that the first eigenfrequencies do not depend on both the shell curvature and the length along simply supported edges. If the length along the simply supported edges is increased, the higher eigenfrequencies are decreased. We come to the conclusion that the internal resonances can occur in such type of shallow shells. Analysis of free and forced nonlinear vibrations of shallow cylindrical panel accounting internal resonances is performed. The backbone curves of shallow shells are hard. The stability analysis of the periodic motions is carried out. The saddle-node and symmetry-breaking bifurcations are observed in the shell. Note, that the constants of integrations are real. Cummings, B.E. : Large-amplitude vibration and response of curved panels, AIAA J. 2, 709–716 (1964). Leissa, A.W., Kadi, A.S.: Curvature effects on shallow shell vibrations, J. Sound Vib. 16, 173–187 (1971). Vol’mir, A.S., Logvinskaya, A.A., Rogalevich, V.V. : Nonlinear natural vibrations of rectangular plates and cylindrical panels, Sov. Phys. Dokl. 17, 720–721 (1973). Srinivasan, R.S., Bobby, W.: Free vibration of noncircular cylindrical shell panels, J. Sound Vib. 46, 43–49 (1976). Cheung, Y.K., Li, W.Y., Tham, L.G. : Free vibration analysis of singly curved shell by spline finite strip method, J. Sound Vib. 128, 411–422 (1980). Li, W.Y., Tham, L.G., Cheung, Y.K., Fan, S.C.: Free vibration analysis of doubly curved shells by spline finite strip method, J. Sound Vib. 140, 39–53 (1990). Liew, K.M., Lim, C.W. : Vibration of doubly-curved shallow shells, Acta Mech. 114, 95–119 (1996). Liew, K.M., Lim, C.W. : Vibration studies on moderately thick doubly-curved elliptic shallow shells, Acta Mech. 116, 83–96 (1996). Baumgarten, R., Kreuzer, E.: Bifurcations and subharmonic resonances in multi-degree-of-freedom panel's models, Mecc. 31, 309–322 (1996). Yamaguchi, T., Nagai, K.-I. : Chaotic vibrations of a cylindrical shell-panel with an in-plane elastic-support at boundary, Nonlinear Dyn. 13, 259–277 (1997). Awrejcewicz, J., Krysko, V.A. : Feigenbaum scenario exhibited by thin plate dynamics, Nonlinear Dyn. 24, 373–398 (2001). Amabili, M.: Non-linear vibrations of doubly curved shallow shells, Int. J. Non-Linear Mech. 40, 683–710 (2005). Breslavsky I.D., Avramov, K.V. : Nonlinear modes of cylindrical panels with complex boundaries. R-function method, Mecc. 46, 817-832 (2011). Breslavsky, I.D., Strel’nikova, E.A., Avramov, K.V. : Dynamics of shallow shells with geometrical nonlinearity interacting with fluid, Comput. Struct. 89, 496–506 (2011). Amabili, M.: Nonlinear vibrations of circular cylindrical panels, J. Sound Vib. 281, 509–535 (2005). Amabili, M.: Theory and experiments for large-amplitude vibrations of circular cylindrical panels with geometric imperfections, J. Sound Vib. 298, 43–72 (2006). Amabili, M.: Nonlinear Vibrations and Stability of Shells and Plates, New York: Cambridge University Press 2008. Leissa, A.W. : The free vibration of rectangular plates, J. Sound Vib. 31, 257–293 (1973). Zhang, L., Xiang, Y.: Vibration of open circular cylindrical shells with intermediate ring supports, Int. J. Solids Struct. 43, 3705–3722 (2006). Hotisseini- Hashemi S., Ilkhani M.R. : Identification of the validity range of Donnell and Sanders shell theories using an exact vibration analysis of functionally graded thick cylindrical shell panel, Acta Mech. 223, 1101-1118 (2012). Aragh B.S., Hedayati H.: Static response and free vibration of two- dimensional functionally graded metal/ceramic open cylindrical shells under various boundary conditions. Acta Mech. 223, 309-330 (2012). Avramov, K. V.: Nonlinear modes of vibrations for simply supported cylindrical shell with geometrical nonlinearity, Acta Mech. 223, 279–292 (2012). Leissa, A.W. : Vibration of Plates, Washington: National aeronautics and space administration 1969. Parker, T.S., Chua, L.O. : Practical Numerical Algorithms for Chaotic Systems, New York: Springer 1980. Yakubovich, V.A., Starzhinskii, V.M. : Linear Differential Equations with Periodic Coefficients, New York: Wiley 1975. Guckenheimer, J., Holmes, P.J. 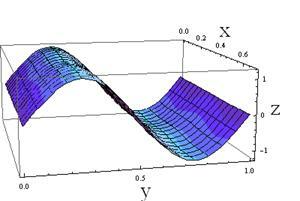 : Nonlinear Oscillations, Dynamical Systems and Bifurcations of Vector Fields, New York: Springer 1983. Kuznetsov, Y.A. : Elements of Applied Bifurcation Theory, New York: Springer-Verlag 2004. Fig. 3. Backbone curve and frequency responses for the first generalized coordinate ξ1. Fig. 4. 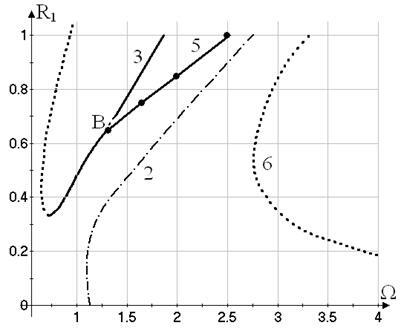 Backbone curve and frequency responses for the second generalized coordinate ξ2.